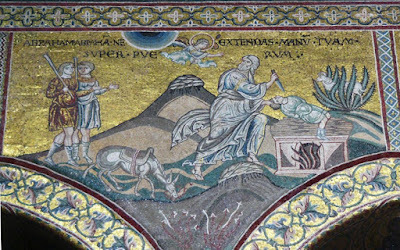 The description of the moment of the sacrifice, stanzas 133 to 139, is,as the writer says, based on actual depictions of the scene and is reminicscent of extant examples from early Christian art, among them a number of sarcophagi. The poem is written in the Syrian metre, known as the ’Metre of Mar Epraim’, which consists of lines of fourteen syllables, with a caesura after the seventh. These are sometimes printed as couplets of seven syllable lines. This is unknown in Greek prosody and is based neither on length of syllabes, as in Classical Greek, nor on patterns of stress accents, as in Byzantine poetry, but simply on the number of syllables. Greek Ephraim also uses on occasion octosyllabic lines, made up of two tetrasyllables. In this poem they are used for Sara’s Lament in stanzas 76 to 92. The text is translated from the critical edition by Mercati. I have, for the moment, accepted his division into four line stanzas, though involves accepting that there some lacunae in the original. The whole of the Greek text is also found among the (inauthentic) sermons of St John Chrysostom. and from all his own. old age was at the door. was bowed with old age. the type of the Master. [to the Saviour of all things]. who do not know man? into the mouth of Isaac. all the ends of the earth. who is born from Mary. he was a delight to his parents. when he sees his child playing. or the love of God. I tremble and am amazed. as he had been promised. as you heard these things? than to accept the order? as his advocate like this? make me a child murderer? a byword to the whole world? with the blood of my own kin? Am I to become a child murderer? that you take you delight? with Sara to be buried? I am to erect for him, tell me? I am to prepare for his marriage? 60. Shall I put a garland on him? Shall I erect a bridal chamber? more fiercely than the fire. he strove to keep her unaware. have pulled him close to her? The following stanzas, which form Sara’s Lament, are in Octosyllabics. an evil tale for the world. in my labour pangs was Isaac. no longer part of the vine. from the deadness that was ours. on which we were supported. on which we take our rest. which we two have gained. from the earth beneath the sky. the lamb that we possess. and fill us with lament. Who will call me ‘Mother’? Who will minister to our old age? Who will shroud us when dead? Who cover our bodies with a tomb? of us for ever childless? you would surely have compassion. of our lack of hope. so granting me the greatest grace. of the barren and her offspring. tell the suffering of both. was about to be slaughtered. showing the call of the nations. like a lamb for us. up the mountain to death. to the slaughter for our sake. the voice of his dearest child? the wood beside the boy. in whatever way he wished. he did not change his mind. treading on his bent knee. nor do any evil to your son. and all the angelic hosts. who had proved most faithful. he made him a prophet. was nailed to a Cross.